As he felt himself moving closer to St Petersburg, Alexander relaxed. For many reasons, Moscow had such bad memories that he never felt at ease there. He was a man of the wider world – and to himself he chuckled, for none of those close to him realised how wide this concept really was – and Moscow seemed so provincial, so stuck in the past. And also so full of his own, now abandoned, past. Surrounded by the luxury of his personal train carriage, he was a man at ease with himself. Already he was writing his future as it would be told in this world's history books. Alexander the Great. Alexander the reformer. The man who had faced down Prussian militarism and ensured peace in Europe. Alexander the train builder … no that made him sound like a child. Alexander the builder … yes that was better. So he relaxed and looked out into the darkness. Dmitryevna – a strange woman but one he felt the need to spend time with. And then to his own world. There he would be favoured, a man who could rescue even the most flawed of experiments, for under his guidance Russia would take the direction it had missed in 1822. The knocking on the door to his private rooms disturbed his thoughts. Even more annoying, he heard the voice of Prince Chepyzhin. The man had been so polite to him since the Prussian crisis it was almost impossible to deal with him. Clearly his success in setting out Russia's policy had annoyed his foreign minister. Well good. 'We are agreed. Good. 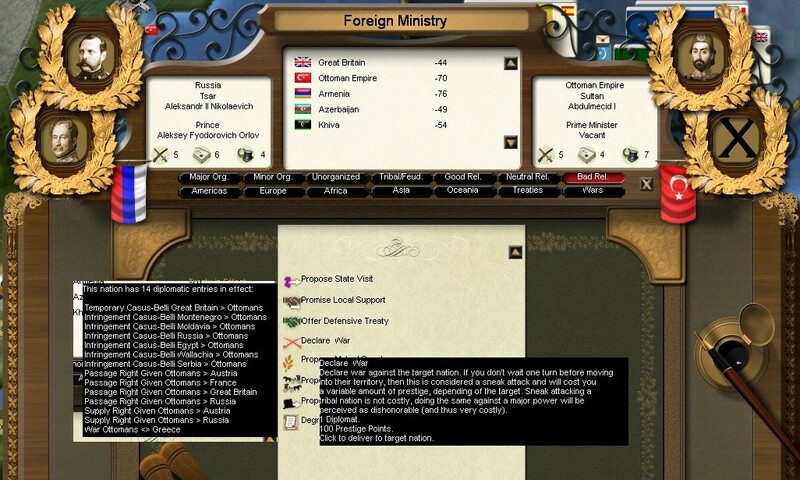 At the last station, I heard from my government, we are now at war with the Ottomans. And we ask for the support you promised'. At this, for the first time in months, Prince Dimitry Petrovich smiled. In reality Greek PM at the post-Great War peace conferences. I'd given them a promise support diplomatic decision as a means to try and get better relations. My logic was that they were isolated so this seemed to be safe. Given the horrendous prestige loss if I don't back them, had little choice but to join in their war. The British also have a promise support agreement – so I could end up fighting alongside the British against the Ottomans? 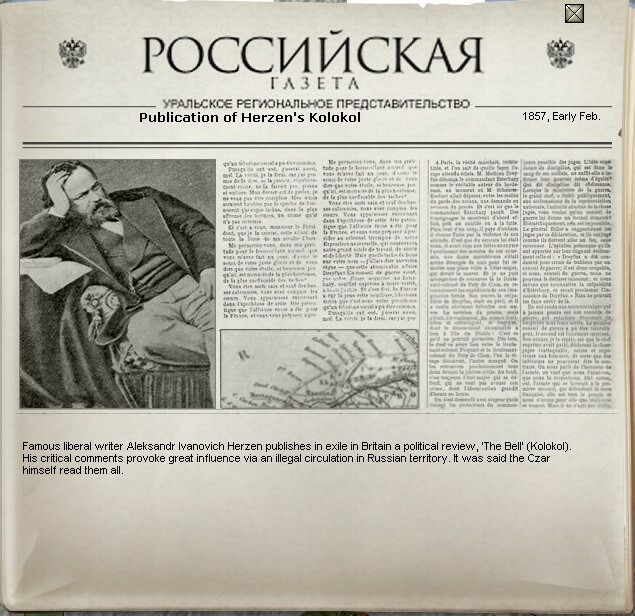 The second war between the two powers in the 1850s was in reality a product of the same struggle for influence between Russia and Britain that dominated the middle years of the nineteenth century. The first came about because Britain wished to use the declining Ottoman empire as a means to stop Russian expansion southwards. In effect, it was an accident, neither Britain nor Russia started by wanting a war but the Ottomans misinterpreted vague promises of Anglo-French support as sufficient to gamble on war with Russia to regain lost territory in the Caucasus. The second came because both Britain and Russia sought influence over Greece. To the classically educated elite in the British state, a fictional, long lost, Greece had a hold over their imaginations. Britain had supported the Greek revolt against the Ottomans in the 1830s and saw the new state as something between its child and a young adult who needed firm guidance. Such sympathy, of course, did not prevent Britain from seizing and occupying Corfu on the pretext of keeping the islands out of Ottoman control. Russian interest was equally driven by a mix of practical goals and heady imagination. Greece was an enemy of the Ottomans with a small but well trained army. As an ally, it would always be useful if Russia had to go to war with the Ottomans. Equally, the port at Athens would give Russia unimpeded access to the Mediterranean, something she would never have as long as Istanbul was in Ottoman hands. But again, self-created myths played a role. As a fellow Orthodox country, Russia imagined that the Greek church yearned for re-unification with the Russian. Equally that they too saw Moscow as the 'Third Rome' even while sharing Russian desires to re-establish Orthodox rule over Istanbul. The problem was that the Greeks were unwilling to commit to either suitor. Well aware her two wooers were at odds with each other, the Greeks proved to be adept at balancing them off and extracting more and more concessions while promising less and less. Thus by the end of 1856, both powers had promised support to Greece for little in return but the hope of better relations in the future. 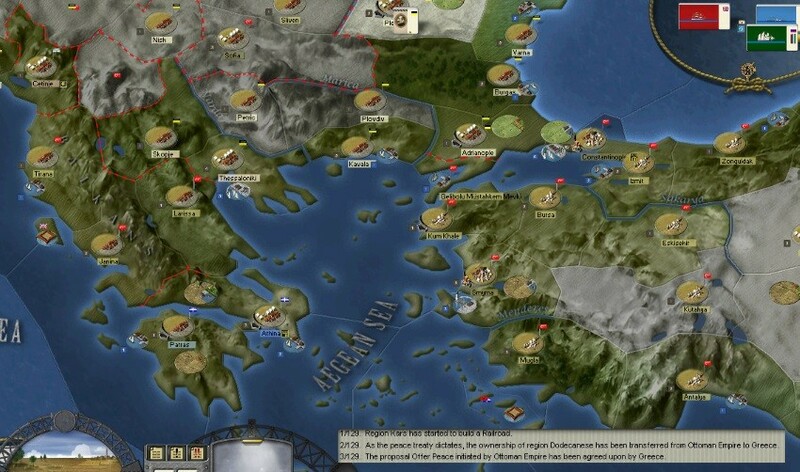 Greece then used that support to commence its own war of conquest on the weakened Ottomans. Reluctantly, Russia honoured its promises and set its armies marching south. War was not unwelcome as the Tsar sought to implement his domestic agenda and sought prestige. Britain, already rocked by a large revolt in India, did not. So, without a shot being fired, Russia gained in terms of international prestige. It could, and did, present itself as a state that stood by its friends. But on the battlefield, the problems of 1852-3 re-emerged. It was again at war alongside an ally very reluctant to co-operate. Still Russian armies quickly set off along well trodden routes westward across Anatolia and southwards from Odessa. The Ottoman armies had scarcely had the chance to recover from the last war and were no match for the Russians on the battlefield. 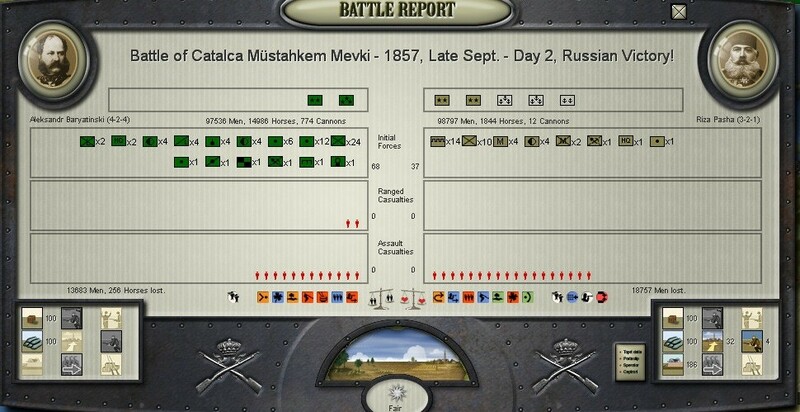 Istanbul again fell to the Russians in September 1857. With this, the Greeks held most of European Turkey while the Russians dominated Anatolia and northern Iraq. It was clear to all, that it was now a matter of finding suitable peace terms. Where was the damn woman? For most of the recent year he had been glad when she went off on one of her secret missions, but today, to his surprise, Vladimir wanted to talk to her. He had news … news of great importance to Vladimir. And, thus, he had decided, of great importance to Maria Bogdanova. After all, even though they disliked each other the Tsar had ensured they had to work together. So she could savour his enjoyment of his reward for their efforts. Her servant suggested she had only left the house that morning so she couldn't have gone far since then. A discrete check of her room suggested she had only taken the clothes she must be wearing. So she couldn't be planning a long trip in any case. She must be going somewhere she felt safe, since she seemed to have left most of her weapons. That struck Vladimir as reckless. Far to the north, the war between the Tsar and the Sultan was one of large armies and major cities. Here it had become one of the knife in the side in a crowded market. A vicious, personal war between agents of the two states seeking influence in this region. Vladimir guessed she might have planned to go swimming. Her taste for these warm waters surprised him but it was probably her only indulgence. If so, he knew where she might have gone. Later that morning, he tied his horse to a scrubby tree. He had guessed right. Across the small clearing was another horse patiently eating fodder. He had come to the correct place. Even so, he moved cautiously and as he reached the edge of the scrub slowly raised his head and looked over the beach. To his surprise, Maria was not alone. That she had lovers was of no surprise, or interest, to him. That she felt the urge to keep them secret was. But looking again, it was clear they were arguing. Even as he watched the man went as if to strike her. 'Big mistake, svinoi' muttered Vladimir. Sure enough, Maria hit him first. At that, the man pulled out a knife. Vladimir sat back. If this was a lover's tryst it had gone wrong. If Maria was killed, he had no-one to tell. So he stood up and moved onto the beach. As he did the fight was nearing his end. The man had fallen to the sand face down. Maria grabbed his neck and twisted. 'Bravo … well done … a textbook example we could use to train new agents'. As he advanced, Vladimir applauded. As he arrived, he realised he had misjudged the situation. In all their arguments, Vladimir had never seen her so angry. 'While I deal, on my own, with the Sultan's latest killer'. To her surprise, Vladimir suddenly jumped at her, bundling her to the ground. Even as they both fell clumsily onto the sand, she heard the pistol shot. And felt her companion regaining his feet and moving quickly towards a gap where a river ran onto the beach. Regaining her breath she followed. A second shot, again poorly aimed and Vladimir slipped out of sight. As she turned the corner she saw he was pointing his own gun at another man. Seeing her, he smiled – 'yours or mine?' Maria contented herself with a simple nod. Vladimir raised the pistol and shot the man. 'This beach is filling up with corpses'. Glancing at the one at his feet, Vladimir asked 'do we dispose of them in the sea or on the land'. 'Land' Maria replied, 'I have still not had my swim'. They dragged the corpse back into the scrub and tipped it into a sun-baked fissure in the soil. Sweating, they returned to the beach and brought the first body up. Even as they dumped that too into the trench, Vladimir saw the glint of a musket. 'Oh this becomes tedious', turning to Maria, he asked 'yours or mine'? To his surprise she smiled and replied 'both'. They split apart and ran to where the third killer cowered. Though killer was perhaps not an accurate description, the man was clearly terrified. With reason. Shortly afterwards his body lay with the others. and to have more men to guard us while we do so'. To his surprise, Maria came back and then embraced him. For one so dangerous, her body felt soft and warm beneath his hands. Where are the narwhals of yesteryear? 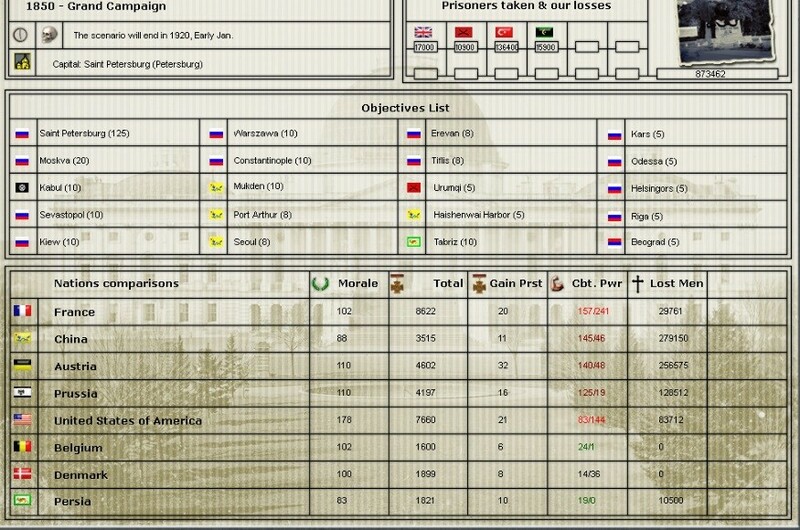 All the AJE aar photos are ether. Will try PON if you can save them. Taillebois wrote: Where are the narwhals of yesteryear? All the AJE aar photos are ether. Will try PON if you can save them. The problem is photobucket. They not only ended the free hosting service they removed all the old images at the same time. Imageshack did something similar in ending free hosting but at least you can still see old uploaded images. So unless he is prepared to actually reload all the images via a new hosting site (and its likely that he's not kept the images - i don't), then they are lost. But its a decision by photobucket as a hosting site. Thanks loki. sorry to interrupt your AAR. I just noticed the same thing on a Hearts of Iron AAR I wanted to re-visit. I guess that's the trouble with free. It doesn't last forever. I just wanted to say that i am still faithfully reading and enjoying this AAR. it will be very interesting to see how the Russian colonization of Aden turns out. vaalen wrote: I just wanted to say that i am still faithfully reading and enjoying this AAR. it will be very interesting to see how the Russian colonization of Aden turns out. Thank you - as mentioned elsewhere I've had 8 weeks with no domestic phoneline or internet connection so I'm afraid updates have been hard to do. I learnt from my Italy AAR just how valuable this corner of the map is. Even just with trading posts, a nice flow of opium, coffee and gems help both with domestic contentment and your balance of payments. Clearly in the context of Russia, less than you gain for a small state but very valuable. Its one of those areas where its worth shedding prestige for practical gains. Also Persia is now a very firm ally, if I can somehow extract Iraq from the Ottomans and actually complete my war in Khiva (which is still ongoing), plus add Bukhara, then the next struggle with Perfidious Albion can take place in India. Anyway next update is about 80% ready, just been a bit of a struggle to get it to fit the wider story (or more strictly to decide who doesn't survive). Stockholm had, in many ways, seen the powers of Europe hanker after a lost past. It was an attempt to insist that the events of 1848-50 had not happened, that Britain, France, the Ottomans, Austria and Russia had not been at war. That Prussia had not attacked Sweden. It was an attempt to assert that Treaty of Vienna, its politics and international norms, still held. Peacemaking in Kiev was different, pragmatic and realistic. 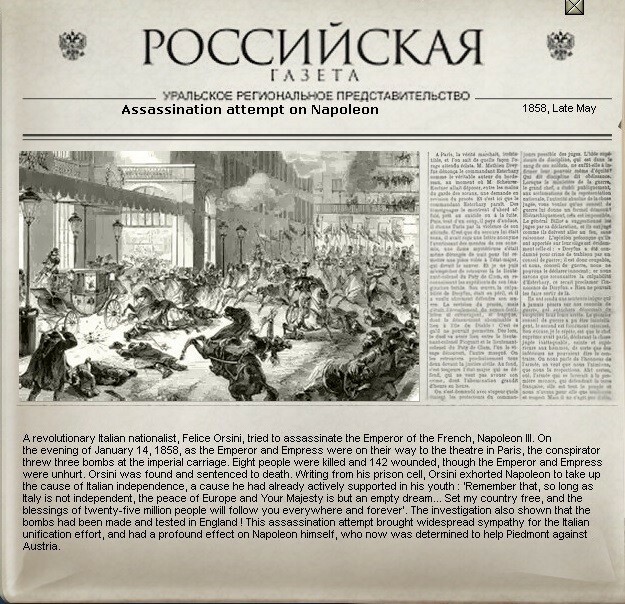 The Sultan had lost the war, Russian troops again occupied his capital. The Greeks had overrun his European provinces. So he begged the Russians for peace. 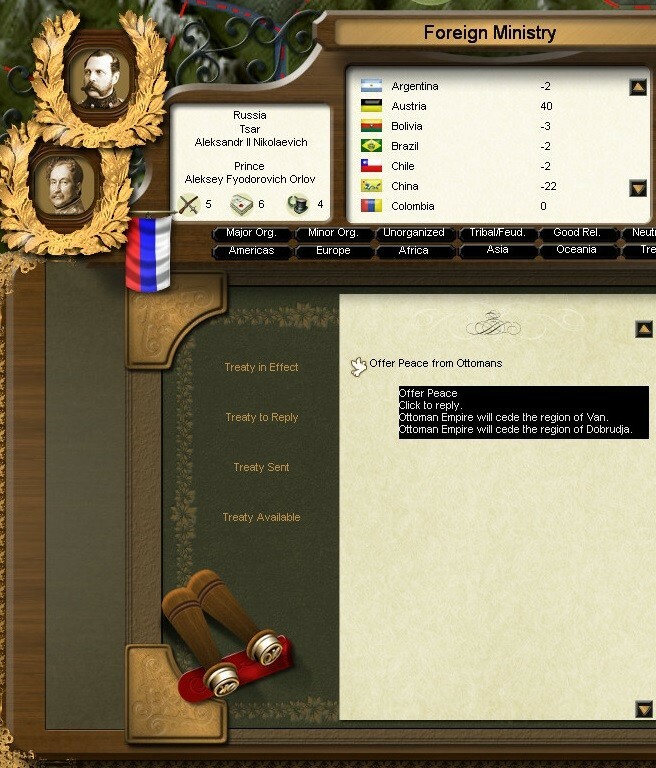 The Tsar was prepared to accept. But, even so, there were things to resolve. Also the Greeks wanted some reward too and were suspicious of their Russian allies. Even if the Sultan had no allies, other powers had their own interests in the settlement of the conflict. So the diplomats met in Kiev – and not just those of the warring powers. And with diplomats came journalists, civil servants and, of course, spies. Thus Kiev again was too full, but this time the visitors were rich, not penniless refugees fleeing war. So the inhabitants set about making money. And the Droshky drivers perhaps made more than most. Though not all of them lived to collect their earnings. Maria Bogdanava shivered as she kept watch on the house. Sooner or later the British spy would make his move and she intended to follow him, find his contacts, and, of course, ensure he never returned to his homeland. To her surprise, she found herself missing Aden. The cold of winter was unwelcome after the year round heat of the newest corner of the Russian empire. Shifting a little, she almost gave herself away but the man was clearly in too much of a hurry to notice a shadow in a doorway. Stepping out into the street he hailed a droshky. Maria quickly ran back to the busy square and stepped into a cab. The driver leaned against the window. Maria hissed. 'Fool, I am not here for your amusement but on the business of the Tsar'. To reinforce this she raised a pistol to the window even as she pressed a coin into his hand. 'Follow that droshky  ... but keep your distance'. If the driver was minded to argue, the combination of gold and threat was enough to gain his agreement. The other droshky had almost disappeared but it was a quiet night. Cold and snowless. Initially it was easy to follow at a distance but slowly the houses thined out as they reached the Zamkova district. Here the city's rich had their homes, many now occupied by this or that temporary embassy. Maria urged the driver to move closer, despite the risks, she could not afford to lose the Englishman. At the least she needed to know which house he had entered. Suddenly, the other droshky disappeared from view. As it slipped out of sight, the sound of a pistol shot and a crash could be heard. Picking up the reins he urged the horse to new speed, and. as they came across the crest of the hill, he had to pull on the reins. The other droshky lay across the narrow road. Maria stepped down and walked cautiously forward. There were no buildings nearby so this must have been an ambush, or the passenger had decided to kill the driver? Reaching the droshky it was clear the driver was dead. Laid across his box seat, still holding the reins. But the passenger was missing. Maria looked down at the snow. Boot prints headed into a nearby wood. And next to each footstep was a bloodstain. It seemed as if someone else wished to kill this particular Englishman. Maria moved quickly into the woods and soon came across the second corpse. To her surprise she recognised the spy. Maron, who Vladimir had arrested in Jerusalem and who had escaped when the British captured Sevastopol. If not quite the last person she expected to see dead in a wood on the edge of Kiev, then still a shock. As she stood, she heard a twig break and twisted around. Facing her was a small slim woman ... in her hand was a pistol. 'No ... now I will not be able to find out who the British are funding in the Ukraine'. The other woman shrugged. 'I had more pressing business ... now' at this she raised the pistol .. 'don't try to stop me leaving'. Maria in turn shrugged. Whoever she was, the night had been wasted. As she reached the road, she realised it had got worse. The Svollich had left her and gone back to the city. Well she would find him tomorrow and settle with him on her own terms. The other woman, she would find too. Somehow. She had a Moscow accent, so she would be found somewhere in Russia. Better terms than I could demand. Van is not immediately useful but with a fort, depot and rail will give me even more control over Anatolia. Dobrudja clears the last barrier to any army marching down the western Black Sea. Again with a rail and a fortress, it becomes both a defensive bastion and a springboard for any future attacks. The Greeks actually carried on the war till late 1858. Possibly not the best gain when they might have captured Thessaloniki? I know, but I really had to use the phrase? He walked quickly through the dimly lit corridors. This was a part o f the complex he had never visited before and it seemed strangely deserted. Not just as he had timed his visit to the early hours of the morning when no-one should have been around. More as if no-one had passed this way for some time. Judging by the sounds, he was either close the outer edge of the building or the latest storm was especially fierce. Even through the steel walls he could hear the howl of the wind, and, sometimes, feel the impact of a gust. Finally, he reached the door to the communications and transport link back to the experimental world. Time to test his priviliges. He raised his hand to the lock and was relieved that the door slid open. It seemed as if his enemies had felt not confident to remove him from the list of approved personnel. Not that he had ever been to this sector before. The door slid shut behind him and he flicked on the lights. And froze. In front of him was a guard robot. A snake, clearly marked with the crossed out 'A'  sat waiting as the door closed behind him. He stood still but realised he couldn't escape. That he had walked into a trap crossed his mind. That he had no choice but to step forward was obvious. To his relief, the snake tasted the air, checked him against its list of approved visitors, and ... settled back down. Sighing he entered the room with the communications links. Even for one as inexperienced as he was, it only took a minute to activate the machinery and prepare the message. The message was simple, finding the intended recipient much more difficult. Frustratingly all the agents in that world were now following their own agendas. They rarely, if ever, bothered to report in using the secure channels. Still he knew where they were. The message was sent to London and St Petersburg, he was sure it would reach the right hands. He closed down the machinery and left. Four people received his message and each re-acted differently. The Empress whose realm spread around most of the world looked at it and responded with one word 'fool'. But she knew it was to late to warn Maron, he would have no advanced communications device when he was on a secret mission for her. The Tsar whose realm spread from the Black Sea to the Pacific Ocean thought about the message and then acted. One of his best killers was ordered to leave Aden and go to Kiev. A fast boat travelled from Abadan  to Aden to pick her up. A young woman looked at the message and smiled. Another young woman looked at the message and smiled. The chance to test her skills against so formidable a foe excited her. She quickly made plans to travel to Kiev. But others also saw what had been done. 'In time, in time ... we will deal with them in time. Then we can close off this monstrosity of a world'. This is one of the ideas in Alastair Reynold's book mentioned at the start. Most robots have been programmed with the constraints developed by Asimov in his SF, but those designed to kill have, fairly obviously, had one rule disabled. They are marked to indicate this lethality. At the moment the Russian Indian Ocean Fleet is actually based in Persia. 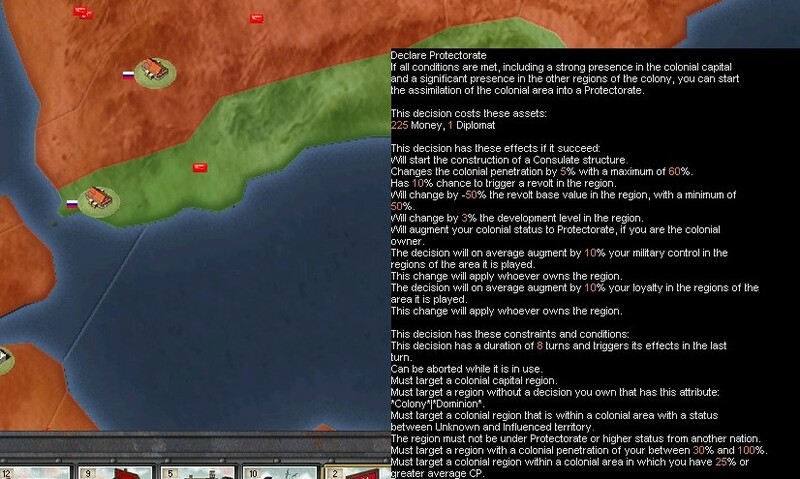 I am not producing enough supply in the Yemen at the moment to base it at Aden. The infamous Roman riots of late 1857 led to a conflict that had engulfed much of Southern Europe by late 1858. Initially, and predictably, the Austrians simply intervened to prop up the Papacy and its control of much of central Italy. The brief re-emergence of the Roman Republic  was bad enough, but the resulting unrest spread across the Papal States. When the Pope fled Rome just before Christmas 1857, the Austrians intervened. Emboldened by their gains in the recent Turkish war, they felt no constraint at re-establishing reactionary control over Central Italy. However, this time, the situation rapidly escalated. Expecting French support, Piedmont declared war in an effort to challenge the return of Austrian rule across most of Italy. By the summer, Turin, Alessandria and La Spezia were under siege. On the mainland only Genoa remained firmly under Piedmontese control. If the conflict had remained limited, it could have been seen as little but another attempt by an external power to control Italy. However, France had been humiliated. She had been prepared to back Piedmont in the event of an Austrian attack, a promise treated by Cavour as backing if Piedmont had been the aggressor. French enthusiasm for their ally was further reduced when an attempt was made to assassinate Louis Napoleon. The Austrians, however, read too much into French caution. No longer fearing that any other power would intervene, it presented new war goals. Quite simply, the incorporation of all of Central and Northern Italy, France felt it had no choice but to protest. The two powers entered into a dangerous war of words. When news of French attempts to rebuild their Ottoman alliance leaked out, the emboldened Austrians authorised their armies in Savoy to enter France. Assured of Russian disinterest, Austria perhaps over-reached. Even as a large part of its army was keeping its fragile hold over central Italy or was pinned into the siege lines at Turin, they decided to try and take advantage of the now badly weakened Ottomans. The opportunity to deal with all their enemies in one war was too much to resist. An understanding driven by the belief that the new Tsar was turning his back on Europe. The lure of an Empire stretching from Warsaw to the Pacific meant he cared little if Austria or France dominated Italy. To this end, he was quite prepared to challenge a China still convulsed by the Taiping Rebellion.